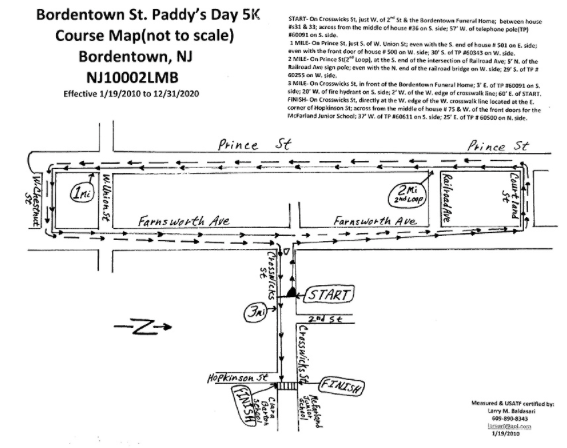 "The Annual Bordentown St. Paddy’s Day 5K Run and Family Fun Walk” is now scheduled for Saturday, March 17th, 2018. This race has become a Bordentown tradition and continues to grow! This event has been a huge success since its inception, attracting hundreds of participants and spectators to historic Bordentown City. It raises thousands of dollars for quality, innovative educational programs for local public schools! Benefit the Bordentown Education Foundation by participating in the 16th annual event through historic Bordentown City. USATF-NJ certified course. Events: 5K starts at 9:00 a.m. - Family Fun Walk starts at 9:30 a.m. Children participating in the Family Fun Walk must be accompanied by an adult. Awards to top 3, Male and Female, 5K finishers. Prizes awarded to top 3 finishers in the following age groups: Under 14, 14-17, 18-21, 22-29, 30-39, 40-49, 50-59, 60-69, 70-79, 80 and over. This race is a USATF-NJ Sanctioned Gran Prix Event with a 500 Point Value.